Audiothing has released Filterjam, a free multi-band resonant filter plugin that you can use to add brightness or depth to synths, completely mangle audio sources, and make ring modulation-type sounds and effects. With Filterjam you can create ring modulation-type sounds and effects. Basic ring modulation multiplies two incoming audio signals (the carrier and modulator). It creates frequencies that are the sum and difference of the frequencies that are present in both audio signals. When the frequencies of the audio signals are harmonically related, ring modulation will create harmonics that conform to the harmonic partials of the carrier and modulator. When the frequencies of the audio signals are not harmonically related, ring modulation will produce inharmonics. Bells, gongs or otherwise percussive metallic sounds, in particular, have overtones which are inharmonic. Can't I Do This with Logic Pro X's Ringshifter Plugin? Well, almost. In both frequency shifter mode and ring modulator mode, Logic Pro X's Ringshifter plugin uses its internal sine wave oscillator to modulate the amplitude of the wideband input signal. The major difference between Ringshifter and Filterjam is that Audiothing's plugin is multiband: it first splits the incoming audio signal into four separate bands. These bands are then summed or multiplied together, based on the mode you choose in the plugin's GUI. You can use Filterjam to add brightness or depth to synthesizer sounds, or to completely destroy acoustic sources, bringing out grit and rhythm that weren't there on the surface. Filterjam is easy on your system's resources, and comes with a preset system and a cool randomize button. Unfortunately, the use of this randomize button cannot be automated. Hopefully the plugin developers at Audiothing will introduce this feature in a future update. 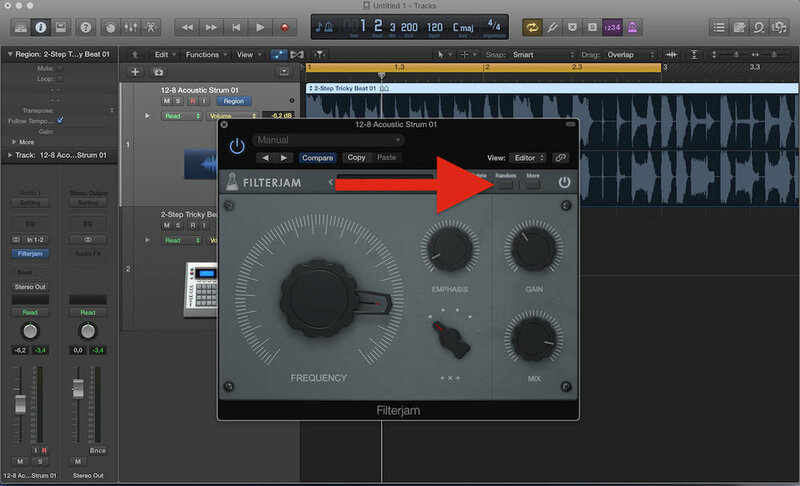 Watch Filterjam at work on some ambient sounds and synths in Logic Pro X. Notice that at 0:54 into the video, multiple instances of the filter plugin are used on multiple tracks to quickly create interesting rhythms. Filterjam comes in both 32- and 64bit versions, in VST, AU, and the AAX plugin format. Your name and email address are required to receive your download links.